This session was a bit of an ordeal for the prime minister, not necessarily for the hard time she got from MPs, but because she is still suffering from a sore throat. She croaked that Penny Mordaunt, the international development secretary, had "very generously offered to teach me sign language" at this morning's cabinet. 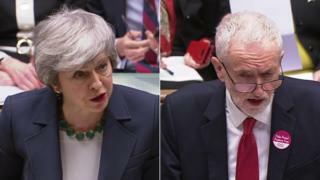 MPs are due to debate a no-deal Brexit later, but Jeremy Corbyn opted to kick off proceedings early, with a series of questions on where Mrs May herself stands on that question and on Brexit in general. Last night's vote on her withdrawal agreement - which was defeated by 149 votes - has "finished off her deal", he told the PM. Which way is she going to vote later? "I will be voting for the motion standing in my name," she replied. Mr Corbyn continued with his attack, claiming that the PM "doesn't seem to understand her deal has been flatly rejected twice". The chancellor and business secretary have both warned of the disastrous economic consequences of a no-deal Brexit, said the Labour leader, why was she still being "ambivalent" about it? Why not back Labour's plan (which would see the UK in a permanent customs union with the EU)? "Businesses worry about the uncertainty of Brexit, but there is one thing they worry about more - and that is a Corbyn government," said the PM. Media captionTheresa May says businesses worry about Brexit uncertainty, but are more worried about a "Corbyn government"
Mr Corbyn has moved towards backing another EU referendum, she told MPs, but he did not even mention it in his speech after last night's vote. It would be "rather reckless" for the PM to rule out any option at this point, said Mr Corbyn. "Britain's food producers are also in despair," he went on. Would she give them "tariff-free access to the single market"? The deal the government negotiated in November "includes access to the European market on the basis of no tariffs", said Mrs May. "It might help if he'd actually read it," she added, to laughter from some MPs. Labour's alternative Brexit plan is now the "the credible show in town, available and ready to be negotiated", Mr Corbyn told her. His deal has been "rejected several times" by MPs, replied Mrs May. "I may not have my own voice but I do understand the voice of the country," she declared, prompting a roar of approval from her own benches, and the opposite kind of roar from the Labour side. Speaker Bercow told them all to calm down. "People want to leave the EU," said the PM, recovering her voice. "They want an end to free movement, they want to have our own trade policy, they want to ensure laws are made in this country," said the PM. "He used to believe that too, why is he trying to frustrate it?" 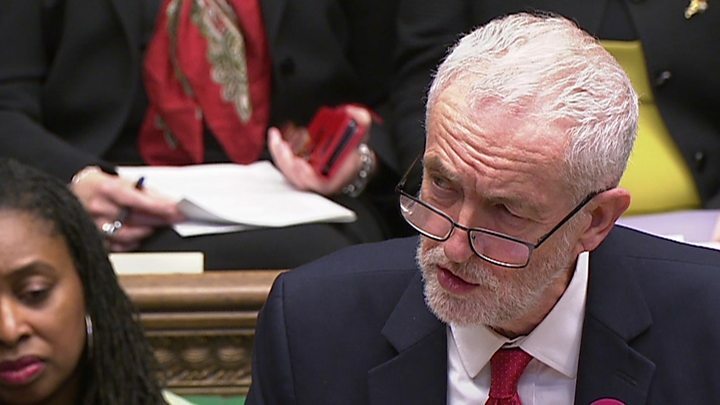 Mr Corbyn expressed sympathy for the prime minister's sore throat, before resuming his attack by telling her she "no longer has the ability to lead". "This is a rudderless government in the face of a huge national crisis," said the Labour leader. "Can the prime minister say exactly what her plan is now?" Mrs May set out the sequence of Brexit votes through which MPs could say what their view was on the "way forward". The government wanted to deliver leaving the EU with a good deal, she said. Mr Corbyn did not even believe in Labour's policy and "he has nothing to offer this country", she concluded. The SNP's leader at Westminster Ian Blackford asked if Mrs May wanted to be the only prime minister to deliberately plunge the UK into recession. He used his second question to call on the PM to whip her MPs vote against a no-deal Brexit later (she has offered them a free vote). Labour's Stephen Hepburn asked about cuts to school budgets. 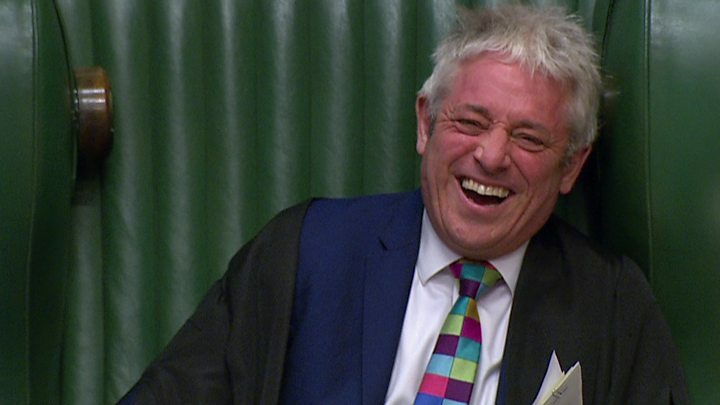 Conservative MP Huw Merriman joked that his Labour-supporting Mum was more likely to love Speaker John Bercow than her son, before he asked Theresa May about school funding. Media captionHuw Merriman tells John Bercow his mother "loves you more than me these days". It's one of those PMQs where you find yourself wondering "what's the point of PMQs?" The one spark flew when Theresa May grated out the line "I may not have my own voice, but I do understand the voice of the country". More interesting was the line of questioning from her backbenchers. 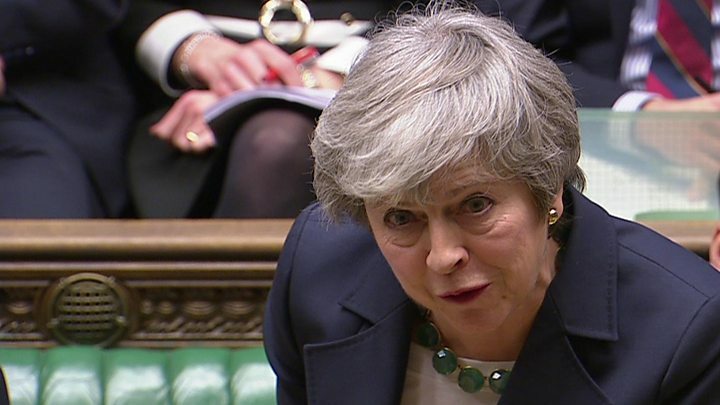 The PM was pressed to back the new incarnation of the "Malthouse Compromise" proposal, which suggests a kind of "managed no-deal Brexit" and a two-year transition period during which Britain continues to pay money into the EU while negotiating an unspecified longer-term trade relationship. This is seen (in a monstrous mix of cliches) as the "Get out of Jail Free Card" which can "get the (Tory) band back together again", in the next big set of Brexit votes later today, on the option of leaving the EU without a deal. It will be interesting to see if this can attract Labour votes as well as Conservatives and DUP MPs - because if it can't, it won't be able to carry the Commons. The PM gave no hint of any plan to whip for this amendment, because, like so many Brexit propositions, it might provoke a spate of ministerial resignations, from one faction or the other. Another important sub-theme was knife crime - with two Conservatives complaining that there were too many instances where possession of a knife did not result in a jail sentence, and one Labour MP linking rising knife crime to the cuts in police numbers. One final anecdote: this morning I was chatting to a Labour MP and a Conservative MP, and the prospect of a snap general election came up. "We'd be slaughtered," said the Labour MP. "No, we'd be slaughtered…" replied the Conservative. Both giggled the nervous giggle of the damned, before agreeing that an election was unlikely. At least for now.